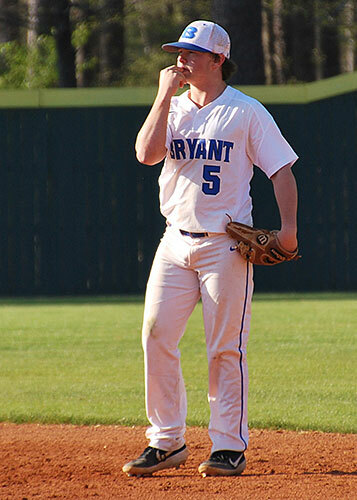 Logan Grant’s sacrifice fly with one out in the bottom of the ninth lifted the Bryant Hornets to a 5-4 win over the Cabot Panthers as the Hornets held on to sole possession of first place in the 6A-Central Conference Tuesday night at Bryant High School Field. The Hornets remain a game up on Little Rock Catholic, which edged Fort Smith Southside 4-3 to improve to 3-1. 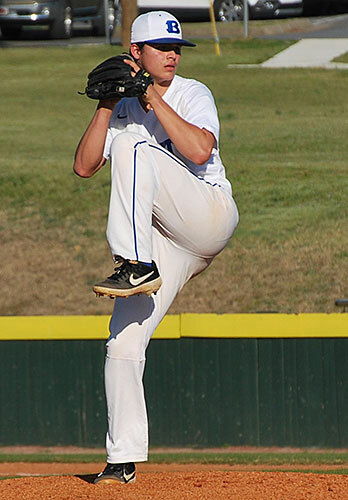 Cabot fell to 2-3 in league play, 12-3 overall, absorbing a rare loss when University of Arkansas commit Zack Morris, a hard-throwing lefty, starts for them. But Morris’ efforts were undermined by sloppy defense. Cabot suffered six errors including four in the first when the Hornets grabbed a 3-0 lead. In fact, all five Bryant runs were unearned including the game-winner. 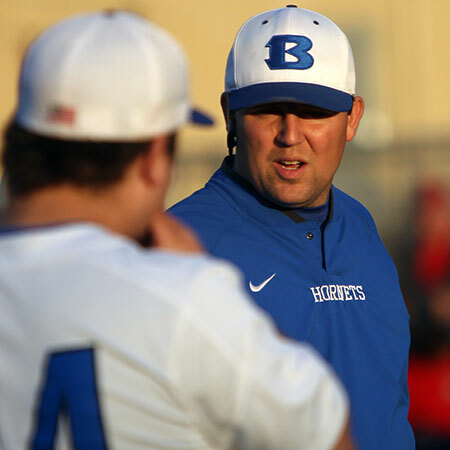 Though Bryant had base-runners in all but the fifth and eighth innings, after a lead-off single by Gage Stark in the sixth, the Hornets didn’t have another hit in the game. But Bryant scrapped to get everything they could and right-hander Coby Greiner, the Hornets’ third pitcher, did a Houdini escape act in each of the last three frames. Getting crucial outs to escape Cabot threats. “That’s a really good ballclub,” Hornets head coach Travis Queck said. “They have so many talented, talented college prospects on that team. I’m proud of our guys for battling up. Cabot, with at least three major college commits in the starting lineup, figured to be one of the top contenders in the league, and may well be again before the season’s over. But mistakes cost them. In the very first inning, the Panthers’ Houston King lined a single up the middle. With one out, Austin Scritchfield hit a soft liner that Bryant second base Noah Davis sprinted in and caught at turf level. King was caught straying too far from first as Davis through behind him for an inning-ending doubleplay. In the bottom of the inning, Logan Chambers drew a lead-off walk and, with one out, Austin Ledbetter rolled out a swinging bunt that was fielded by first baseman Logan Bell. Morris was on his way to cover first but Ledbetter beat him to the bag. Morris then dropped the throw and Chambers continued on to third, just beating the relay there. Cade Drennan drove in the first run by getting a squeeze bunt down. Jake Wright struck out, but the third strike got away from Scritchfield, who didn’t get to the ball in time to throw Wright out at first. With runners at the corners, Morris tried to pick off Wright at first only to have Bell misplay the throw. Chambers scored, and Wright wound up racing all the way to third. He scored when Grant’s one-hop shot at Zach Slunder at second was misplayed. 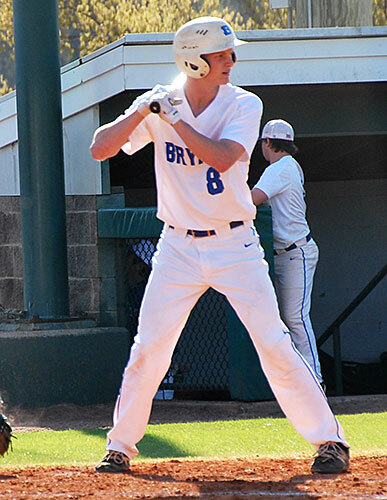 Gage Stark, who had two hits in the game, followed with a double down the left-field line but, after a visit from his coach Ronnie Goodwin, Morris escaped further damage with a strikeout. Cabot got a run back in the top of the second with the help of a Bryant miscue. Blayse Quarlstrom’s single was misplayed allowing him to reach second. Jackson Olivi singled him to third then a wild pitch allowed the run to score before Ledbetter struck out the side. The Hornets made a bid to get that run back. Greiner ripped a double to right-center then tried to score on Chambers’ single to right. But King came up throwing and nailed Greiner at the plate. Chambers was stranded at second. Cabot tied it in the top of the third. King doubled, and Clayton Gray walked. Scritchfield got a bunt down but Ledbetter pounced on the ball and fired to Chambers at third for a force. Quarlstrong followed with a single, however, that made it 3-2. With two away, Morris singled to left and, when it was misplayed, Grant Fitch, running for Scritchfield, came in with the tying run. A walk to Bell loaded the bases and Queck brought in senior Will McEntire to relieve. He got Slunder to ground to Chambers at short who got a force to end the inning. Drennan opened the bottom of the third with a solid single to center. Ryan Riggs came on as a courtesy runner and, on a wild pitch and Wright’s deep fly to center, he reached third. With two down, Stark ripped a liner that third baseman Kyler Franks speared to prevent another run. The Panthers took the lead in the fourth on a triple by King and a double by Gray. 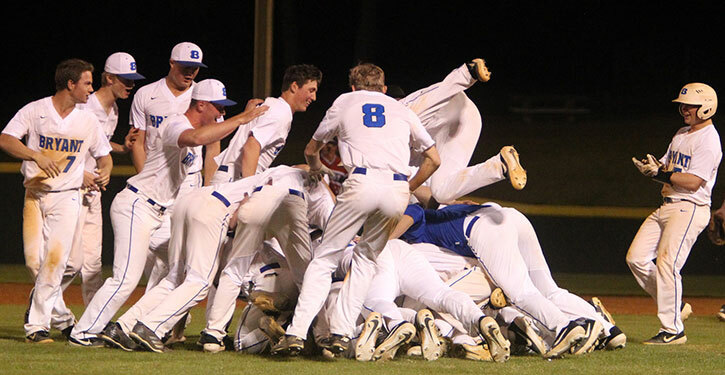 McEntire escaped when Scritchfield popped to third and Quarlstrom hit a shot to first that bounced off of Dillon, ricocheted to Davis, who threw back to Dillon for the out. Dillon was then hit by a 1-2 pitch from Morris to lead off the bottom of the fourth. Greiner beat out a bunt single then Chambers grounded into a force at second. With runners at the corners, Davis attempted to get a squeeze bunt down but just fouled it off. The ball appeared to hit Scritchfield on the throwing hand and he eventually had to come out of the game. Jaidon Ryals took over behind the plate. Davis hit a fly to right that wasn’t deep enough to get Dillon home. Though Chambers stole second, Ledbetter fouled out to first to keep it 4-3. Neither team mustered much offense in the fifth. 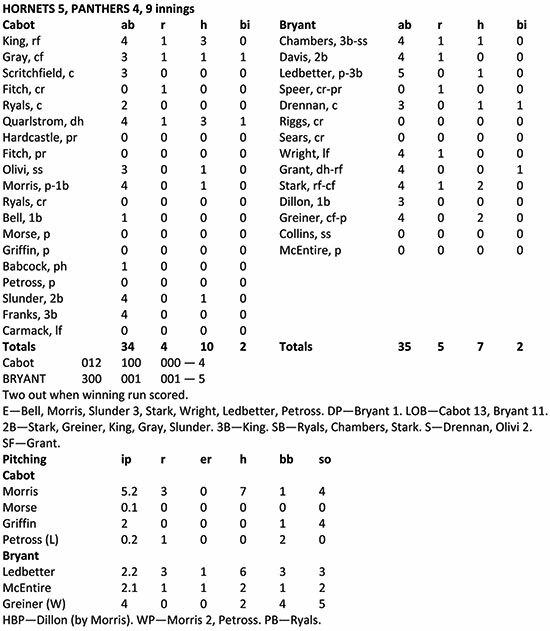 Greiner pitched around a two-out walk and Morris set down the Hornets in order. The Hornets tied it in the bottom of the sixth. Stark ripped a single to left, which proved to be the last Bryant hit of the game. He stole second and, with two out, scored when Chambers one-hop shot got past Slunder at second. By then Morris had reached his pitch limit with 109. Braydon Morse relieved and retired Davis to send it to the seventh. In the seventh, Quarlstrom reached on a throwing error. Zach Hardcastle came in to run for him and Olivi sacrificed him to second. Morris grounded out to short as Hardcastle advanced to third. Bell walked for the third time in the game. With an 0-2 count on Slunder, Bell left first early, trying to get in a rundown that would allow Hardcastle to score. But the Hornets executed the rundown so well, Bell was tagged out before Hardcastle could get home. In the home half, Ledbetter reached on a third-strike passed ball as right-hander Mason Griffin took over on the mound for Cabot. Pinch-runner Lawson Speer went to second on Drennan’s grounder to first then Wright drew a walk. Griffin worked out of the jam, however, getting Grant to pop out to the catcher then striking out Stark. Slunder opened up the eighth with a double to left-center putting Greiner under the gun. But he stepped up by bouncing quickly off the mound to field a bunt by Franks. He fired to third in time to retire Slunder. Still, King walked to put runners at first and second. But Greiner got Gray to fly to Wright in left, then struck out Ryals to end the inning. 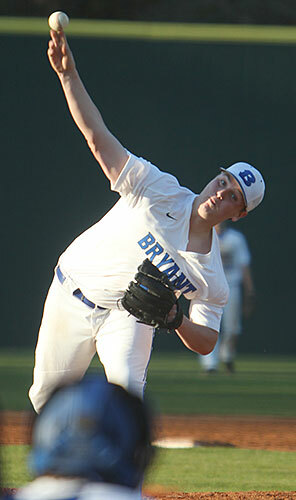 Griffin struck out the side in the eighth and, once again, Cabot threatened in the top of the ninth. Quarlstrom singled and Olivi sacrificed him to second. Fitch came on as a pinch-runner as Morris drew a walk. But, again, Greiner came through by fanning pinch-hitter Patrick Babcock and Slunder, the guy who had doubled off of him the previous inning. 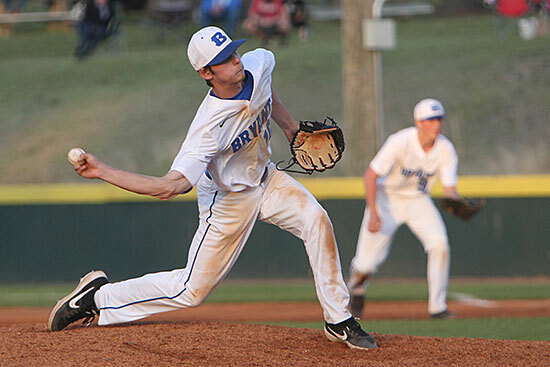 Bryant’s ninth began with a walk issued by Lucas Petross, the fourth Cabot pitcher. A wild pitch allowed Davis to reach second. Ledbetter followed with a tap back to the mound. Davis got caught in a hot box but when the ball was dropped during the rundown, he scampered safely into third as Ledbetter hustled into second. 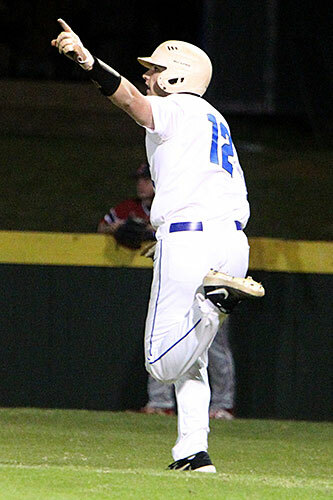 The Panthers walked Drennan intentionally to load the bases and set up a force at any base. Petross got Wright to pop to short but, on his next pitch, Grant belted a long fly to center. Davis tagged and scored as the Hornets walked it off.